Next in the “Meet the Pros” series is Joy Leising. Joy is a natural on the pickleball court, who first picked up a paddle in 2013 and has already taken gold medals home from the USAPA Nationals! 1) Can you list for us your major wins so we can correctly introduce you to our readers? 2) What paddle do you play with and why? I play with the Onix Evoke Paddle 8.0. A year ago at the Grand Canyon Games, I asked Steve if I could try an Onix paddle and one that might be a little heavier. He passed me the Evoke and ever since that day on the Surprise City Courts, I could not take it out of my hands. The paddle has a lot of pop and also feels really balanced so I can have control on the dinks and ground strokes, but when I need to put the ball away, the pop in the paddle allows me to do that. 3) What’s your pickleball story? How were you introduced to pickleball? I was introduced to pickleball by my women’s doubles partner Christine Barksdale. We had played tennis on the same team for 6 years and she started getting more into pickleball and I was a little curious about it. She then asked a few of her tennis friends to go to Canada in Summer of 2013 for a fun weekend . She then told me later she would be playing in a pickleball tournament while we were in Abbotsford and that I should play. My response was I don’t even know how the game is played or how to keep score- how can I play a tournament? She said it would be fine and just fun so we drove up to Canada Nationals and laughed a lot and played women’s doubles and singles. I ended up getting bronze in singles and also getting the pickleball itch. After returning from Canada I didn’t play much and Chris was needing a partner for the Pickle Barrel tournament in Vancouver, Washington. She asked me to partner with her and my response was yes, but that I would need to practice a lot since I am new to the game. The Pickle Barrel was my first official tournament and we placed Gold in Women’s 5.0 and from there, our doubles partnership began and I was hooked on the sport! 4) What’s your preference – playing indoor or outdoor? I used to think I didn’t have a preference because I started to learn indoors. After my first nationals this year though, I think outdoors is my preference. It’s more like a tennis court and I like the outdoor ball. 5) Do you like singles or doubles better? Why? Gosh, that’s a hard question! I feel like they are two completely separate games so I would say I like them both. In singles, I get to hit more groundstrokes and get more exercise. Doubles is a lot about setting up your partner and patience which is fun and exciting. 6) What’s your favorite place to play? Why? That is a hard question. I have been really lucky to travel to so many beautiful places this year playing pickleball. Utah has been one of my favorites. The Brigham and St. George Courts are awesome and I love playing at the Surprise City Courts in Arizona as well. 7) What’s your secret sauce? Any tips for players? Remember to have fun, change up your game/strategy if things aren’t working and use your timeouts to refocus. A pickleball game can go by so fast- it’s good to remember to slow down and think. 8) What’s your day job? 9) How many hours a week do you play? How do you make time to play? It depends on the time of year because outdoor play time is limited in Oregon with the rain. I usually play between 2-6 hours a week. It is a challenge balancing work, life and pickleball but I usually set up drilling sessions with my partner Christine outside and also hit the gym with the Columbia Pickleball Club who reserves courts in local gyms during the winter and are great at organizing folks. 10) Any lucky rituals before a big tournament? Not really. Coconut water, sleep, good food and focus on playing the best game I can play. 11) Do you have any pickleball goals you’d like to share? I would like to play at Tournament of Champions this year since I have never gone and hear such great things about this tournament. I would also like to continue to medal at Nationals, improve my game with more singles and doubles drilling sessions and increase my cross training workouts so I can be more fit for the 6 hard days of play at Nationals. 12) Do you mind sharing about your personal life? Are you single? Married? Kids? I am married to a great man, John Paul, who supports and understands my many hours of travel and time on the pickleball courts. We also have 2 cats. 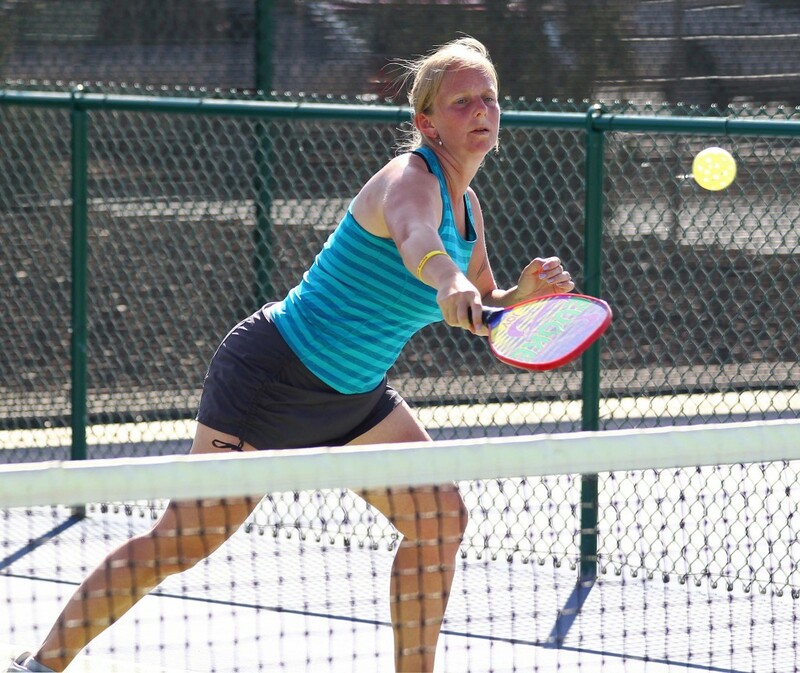 13) Anything else you’d like to share about your experience being one of the best pickleball players in the world? I would say I need about 15-20 years of pickleball under my belt before I could say that. Although I have been lucky to be surrounded and practice with many of the best players, I have a lot to learn and develop in my game to consider myself one of the best. Sure would love to see some videos!